Dynamics 365 for Customer Engagement supports integration with SharePoint Online that enables you to use the document management capabilities of SharePoint from within Dynamics 365 for Customer Engagement. Dynamics 365 for Customer Engagement Portal now supports uploading and displaying documents to and from SharePoint directly on an entity form or web form in a portal. This allows portal users to view, download, add, and delete documents from a portal. Portal users can also create subfolders to organize their documents. Document management works only with SharePoint Online. Document management is supported with server-based integration. You must enable document management functionality in Dynamics 365 for Customer Engagement by using server-based SharePoint integration. 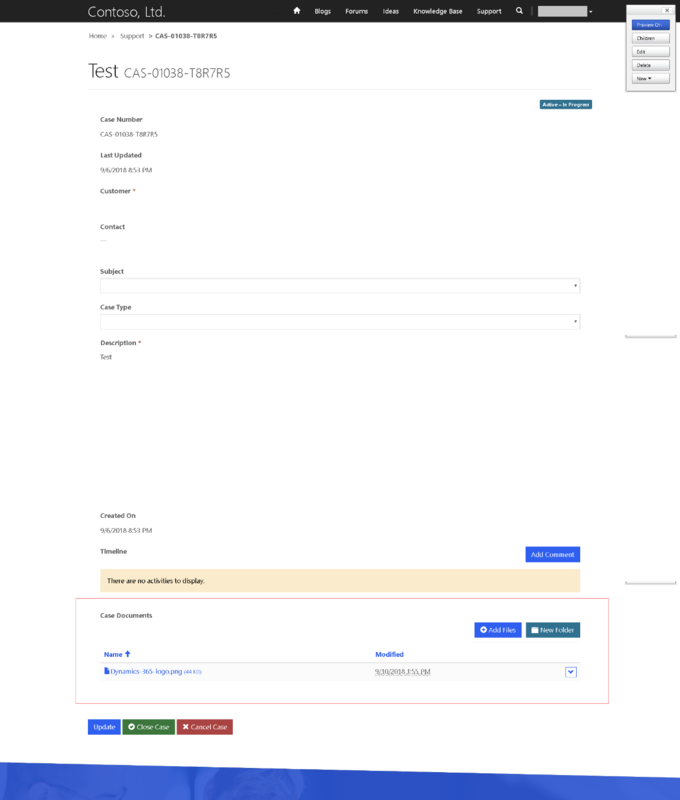 Server-based SharePoint integration allows Dynamics 365 for Customer Engagement and SharePoint Online to perform a server-to-server connection. The default SharePoint site record is used by the portal. For information on how to enable document management functionality in Dynamics 365 for Customer Engagement, see Configure server-based authentication with Dynamics 365 for Customer Engagement apps (online) and SharePoint Online. To use the document management capabilities of SharePoint from within Dynamics 365 for Customer Engagement, you must enable SharePoint integration from the Portal Admin Center. You must be a global administrator to perform this action. Go to the Dynamics 365 Administration Center page and select the Applications tab. Select the name of the portal for which you want enable SharePoint integration, and then select Manage. Go to Set up SharePoint integration > Enable SharePoint integration. Select Enable in the confirmation window. This will enable the portal to communicate with SharePoint. While the SharePoint integration is being enabled, the portal restarts and will be unavailable for a few minutes. A message appears when SharePoint integration is enabled. Disable SharePoint integration: Allows you to disable the SharePoint integration with your portal. While the SharePoint integration is being disabled, the portal restarts and will be unavailable for a few minutes. A message appears when SharePoint integration is disabled. Enabling or disabling the SharePoint integration will update the Azure Active Directory (Azure AD) application for the portal and add or remove the required SharePoint permissions, respectively. You will also be redirected to provide your consent for the changes to be made in the Azure AD application. Enabling or disabling the SharePoint integration will not be complete and an error message will display. Your out-of-the-box Azure AD login on the portal will not work. You must enable document management for entities to store documents related to Dynamics 365 for Customer Engagement entity records in SharePoint. For information on how to enable document management for entities, see Enable SharePoint document management for specific entities. 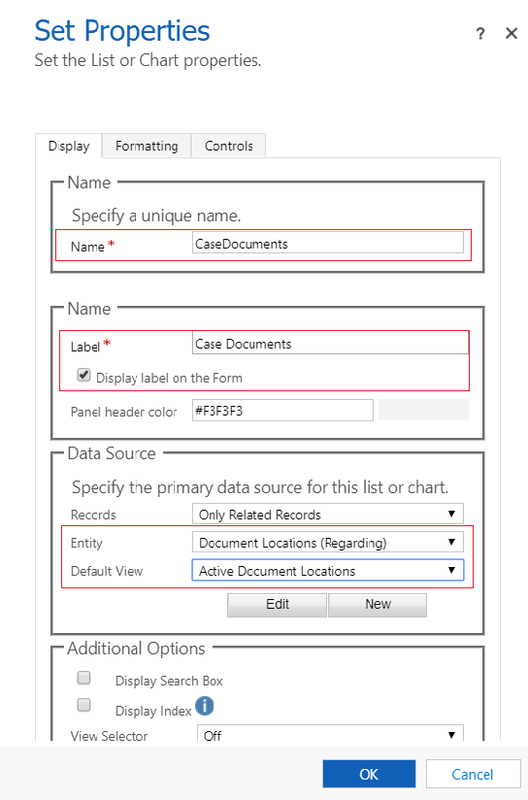 Under Data Source, select Document Locations from the Entity list. Under Data Source, select Active Document Locations from the Default View list. You can specify name and label as per your requirement. Save and publish the form once the subgrid is added and configured. If you do not already have an entity or web form configured, then configure one. For more information on configuring entity forms, see Add a form to your portal. If you are configuring this on a web form, see Define web form properties for portals and Define web form steps for portals. Entity Name and Form Name: Enter the Dynamics 365 for Customer Engagement entity and form names customized in the previous step, respectively. Select the Enable Entity Permission check box on the form to allow a user to read the documents. Set the Mode to Edit to allow document uploads. Document uploading requires the parent entity record to exist. If you set the Mode to Insert, the document upload will not work because the parent entity record is not created until the form is submitted. Two entity permission records are required to establish the necessary access to view and upload documents. Create an Entity Permission record specifying the Entity Name as the entity of the entity form or web form configured previously. Select a Scope and scope relationship that is appropriate to the desired behavior of the form. Enable Read and Append To privileges to allow read access to documents and optionally enable Write privilege to allow document uploads. Ignore the Child Entity Permissions section for now since it will be populated by the next step. Create an Entity Permission record specifying the Entity Name as Document Location entity with Scope set to Parent. Select the Parent Entity Permission to the entity permission record created in previous step. The minimum privileges to allow read access to documents are Read, Create, and Append. Include Write privileges for document upload access. Include Delete to allow deletion of a document. A corresponding child entity permission on the Document Location entity needs to be created for each instance of the parent entity permission record that exists on the entity of the entity or web form where documents need to be shown. By default, the file size is set to 10 MB. However, you can configure the file size to a maximum of 50 MB by using the site setting SharePoint/MaxUploadSize. 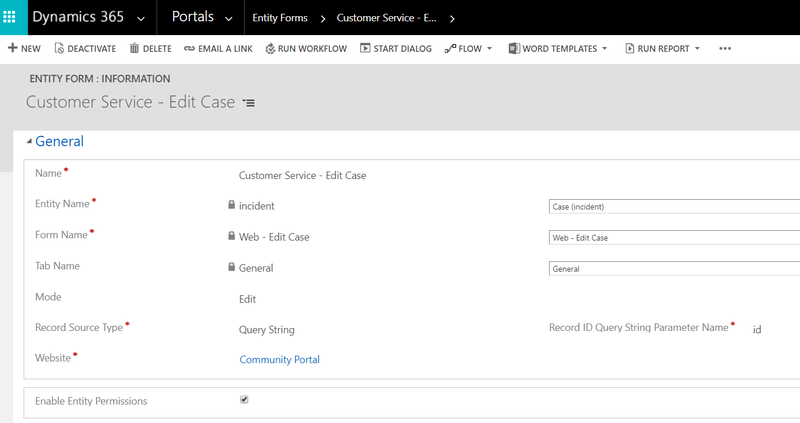 This sample provides exact steps and configuration values to enable document management on the Case entity in Community portal. Follow the instructions in Step 1 to ensure that server-based configuration is complete for Dynamics 365 for Customer Engagement and SharePoint integration. 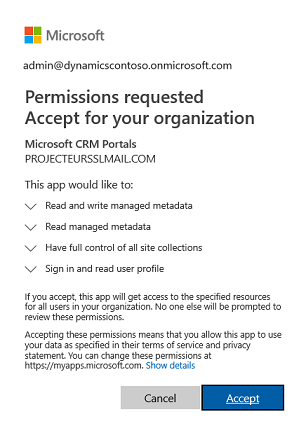 Follow the instructions in Step 2 to ensure that the portal has permissions to integrate with SharePoint. Follow the instructions in Step 3 to ensure Document Management is enabled for the Case entity. a. Go to Settings > Customization > Customize the System. b. In the Default Solution, go to the Case entity > Forms. c. Open the Web – Edit Case in form editor. 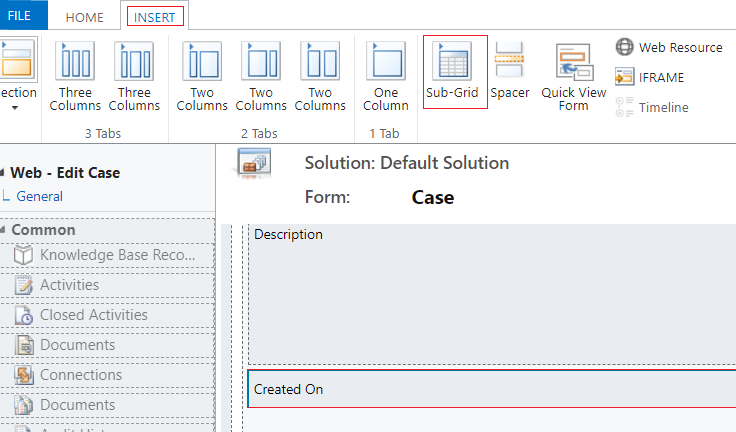 d. Select the Created On field on the form, and on the Insert tab, select Sub-Grid. f. In the form editor, select Save and then select Publish. a. 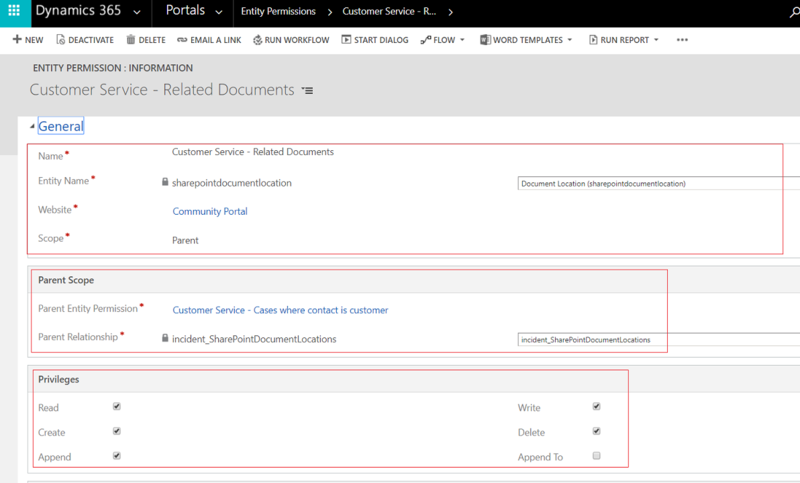 In Dynamics 365 for Customer Engagement, go to Portals > Entity Forms. b. Find and open Customer Service - Edit Case entity form. d. If you’ve made any changes to the form, select Save. Follow Step 5 to make sure entity permissions are granted to the users. Go to the Web Role record that is associated to the user. For this sample, we’ll assume that the user has an Administrator web role. Ensure that an Entity Permission record exists by the name of Customer Service - Cases where contact is customer. Ensure that your web role has this entity permission added. If your user is already an Administrator, then the above entity permission need not be explicitly assigned. Sign in to Portal to ensure document management is enabled for the Case entity. a. Go to the Support page. b. Click on an existing Case record from the list. Go to the Case Documents section on the page and see the document list added.